Dr. Bela Reinhardt invites a group of connected but unsuspecting individuals to his castle, and monster mayhem ensues. Reinhardt is revealed to actually be Bela Frankenstein, son of Peter Frankenstein and a gypsy girl revealed to be the sister of Bela Blasko. A wolfshead cane appears (“a morbid keepsake”) and an old gypsy verse is quoted: “Even a man who’s pure in heart…” Among Reinhardt’s books is Alhazred’s Alchemy of Transmutation. Later, a Frankenstein Monster is released, and Dracula and his Brides show up. Reinhardt’s lab contains a fossilized Gill-Man hand, as well as one of Dr. Pretorius’ homunculi. Peter Frankenstein is from the film Son of Frankenstein. 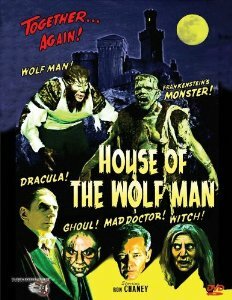 Mark Brown conflated Peter with Dr. Frederick Frankenstein from the film Young Frankenstein in his essay “The House of Frankenstein” (found on the website An Expansion of Philip José Farmer’s Wold Newton Universe.) Bela Blasko is the werewolf that bites Larry Talbot in the film The Wolf Man, which is also the source of the wolfshead cane and the old gypsy verse. Alchemy of Transformation’s author is Abdul Alhazred, best known as the author of the Necronomicon in H.P. Lovecraft’s Cthulhu Mythos. The fossilized Gill-Man hand is from the film Creature from the Black Lagoon, while Dr. Pretorius’ homunculi are from The Bride of Frankenstein.